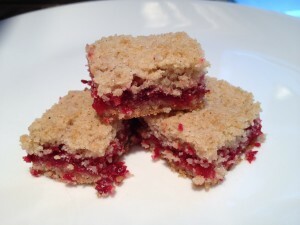 I mentioned these cranberry crumb bars last week in my cookbook book club post. I loved the sweet/tart combo of the cranberry filling. The recipe is incredibly easy to make; the base and the topping are one and the same, and the filling does not require cooking. A quick blitz in the food professor is all the cranberries need. This is a terrific autumn dessert and would be great addition to your Thanksgiving dessert table. Preheat your oven to 375°F. Line the bottom of a 9-by-13-inch baking pan with parchment paper, and butter the sides and the parchment. In a large, widish bowl, whisk together the flour, sugar, salt, baking powder, and spices. With a pastry blender or fork, work the chilled butter and the egg into the flour mixture until the mixture resembles a coarse meal. Pat half the crumb base into the bottom of your prepared pan; it will be thin. Bake cookies for 30 to 35 minutes, or until lightly brown on top. Cool completely before cutting into squares.